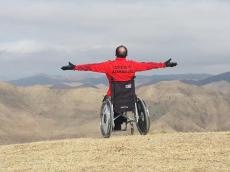 "I want to fly", a documentary highlighting the life of an Azerbaijani Paralympic athlete has been screened as part of the Italian-Azerbaijani International Film Festival. Directed by Maria Ibrahimova, the documentary tells the story of Kamal Mammadov, who was confined to a wheelchair after receiving spinal injuries in a traffic accident, but who has continued to struggle for life and achieved great success, Trend reported. Mammadov, confined to a wheelchair, did not lose faith and came to lead an active lifestyle. In 2012, Kamal Mammadov was the first Azerbaijani, disabled of the first group who made a parachute jump. He did it again with Azerbaijani flag in Belarus, Ukraine and Russia. Mammadov took the bronze in the dancing competition among the disabled. The next year Mammadov took a gold medal at the Paralympics and became the Azerbaijani champion in fencing. In 2014, Mammadov became the first disabled person in Azerbaijan who made a flight on a paraglider. He created a public organization to provide assistance to athletes with disabilities. At the same time he joined the Paralympic Committee and became infatuated with fencing and in wheelchair dance sport. The Azerbaijan Paralympics Committee includes hundreds of athletes, many of whom have achieved many successes since 1996 as a result of sound policies. In the same year for the first time, the country was represented at Atlanta Summer Paralympics Games with two athletes, representing two sports. On January 30, Nizami Cinema Center will host a gala-night of the festival, where the winners of the festival will be announced.